That is something I think about a lot, practically every day. In other words each time I am sitting across from a founder listening to that founders’ explanation of a startup’s market, the problem it is solving, and its business model, I am also thinking about the economic moats it might build around itself in order to sustainably fend off competition. One way it might do that is through network effects. To ensure we are on the same page, let’s start with some definitions. In the rest of this discussion I am primarily focused on early stage technology startups. Definition #1: What is a startup? A startup is a temporary organization built to search for the solution to a problem, and in the process to find a repeatable, scalable and profitable business model that is designed for incredibly fast growth. The defining characteristic of a startup is that of experimentation – in order to have a chance of survival every startup has to be good at performing the experiments that are necessary for the discovery of a successful business model.3 As an investor, I hope that each early stage startup in which I have made an investment matures into a company. Definition #2: What is an economic moat? An economic moat is a structural barrier that protects a company from competition.4 In my case, when I am studying a startup, I am interested in the economic moats that will enable the startup to mature into a great business, and hence a great company – one that can keep competition at bay while earning great returns for its investors. Morningstar identifies 5 moat sources; Intangibles, Cost Advantage, Switching Costs, Network Effect, and Efficient Scale. Definition #4: What is a Network Effect? A network effect occurs when the value of a good or service increases for both new and existing users as more customers use that good or service.6 The network effect is a virtuous cycle that allows strong companies to become even stronger.7 Network effects are also known as direct-benefit effects. I think direct-benefit effects makes it easier to remember why network effects can be such a powerful economic moat. How do network effects develop? Direct-benefit effects develop and become stronger in settings where some form of interaction, or compatibility with others is important.8 In other words, the number of other people using the technology has a direct impact on how valuable that technology is to each individual user. Direct-benefit effects contribute to the strengthening of an economic moat only in so far as they directly contribute to increasing positive externalities for the members of the network. What is an externality? It is “any situation in which the welfare of an individual is affected by the actions of other individuals, without a mutually agreed-upon compensation.”9 One can have positive or negative externalities. A positive externality occurs when individual and aggregate welfare increases with the addition of more users to the network. A negative externality occurs when welfare decreases with the addition of more users.10 Network effects evolve positively for a startup if the members or users of the network derive both inherent value and network value from their use of the product. Inherent value is value that an individual user derives because of that individual user’s consumption of the product or service. For example, even if I were in a network compromising only me, I would derive inherent value from owning one copy of MS Office running on Windows because I could now more easily do word-processing using MS Word or analyze quantitative data using MS Excel. I derive network value from MS Office and Windows because if other people buy and use those products, it becomes easier for me to share my work with them and for them to share their work with me. I derive network value from being able to collaborate with every other person who also uses MS Office and Windows. Direct network effects or one-sided network effects occur when increased usage leads explicitly to increased welfare for the members of the network. Think fax machines, telephones, messaging apps. Indirect network effects occur when the proliferation of network members leads to the proliferation of complementary goods and services such that the welfare of the network’s members increases significantly. Think iOS, Android, smartphones and apps. Two-sided network effects are distinct from indirect network effects. A two sided network effect occurs when an increase in usage of the product by one group of network members increases the welfare of a separate and distinct group of other members of the same network. Think marketplaces, platforms that combine hardware and software, and software pairings in which there’s a reader and writer. Local network effects occur when an individual network member’s welfare increases not because of an increase in the overall network user base, but as a result of growth in the users within a localized subset of the network’s membership. Think; as a user of Whatsapp, my welfare increases when more people in my cellphone’s contact list join the Whatsapp network. So, while I think it’s great that Whatsapp has 500 Million users, my welfare has no positive correlation to the size of Whatsapp’s network. However, it does have a positive correlation with how many of my friends, family, colleagues, social and professional acquaintances become members of the Whatsapp network. How might a startup start to experience negative network effects? One of the most exciting things about the Internet is that it has lowered the barriers to competitors entering a space in which they perceive an opportunity to earn economic profits. That is great if I invest in a startup that is earning such profits, but not so great if events unfold such that other startups can launch a credible attack in order to win business away from the startup in which I am an investor. Lock-in or switching costs occur when a member of one network cannot switch from that network to another without suffering substantial costs. The switching costs could be monetary and non-monetary. Often, the non-monetary switching costs far outweigh the monetary costs. Non-monetary costs might include the loss of massive amounts of information and data, business process disruptions, and so on and so forth. Antitrust regulators do not like to see situations in which such costs bar new competitors from entering a market and create a monopoly for an incumbent – IBM, Microsoft and Apple have all faced antitrust action. Switching costs can also exist in physical goods industries, for example razors and blades, and also printers and printer-cartridges. Switching costs are not an issue as long as users perceive that they derive more value from being within the network than the inconvenience they suffer as a result of lock-in or switching costs. Network congestion occurs when the experience of each member of the network deteriorates as the network’s membership grows. In other words the network becomes less efficient from the users’ perspective. As a result of this each member of the network derives decreasing inherent and network value from the network. Think; A website, web or mobile app that is consistently unavailable because too many people are trying to access it simultaneously. But many kinds of value are created within networks. While many kinds of value grow proportionally to network size and some grow proportionally to the square of network size, I’ve discovered that some network structures create total value that can scale even faster than that. 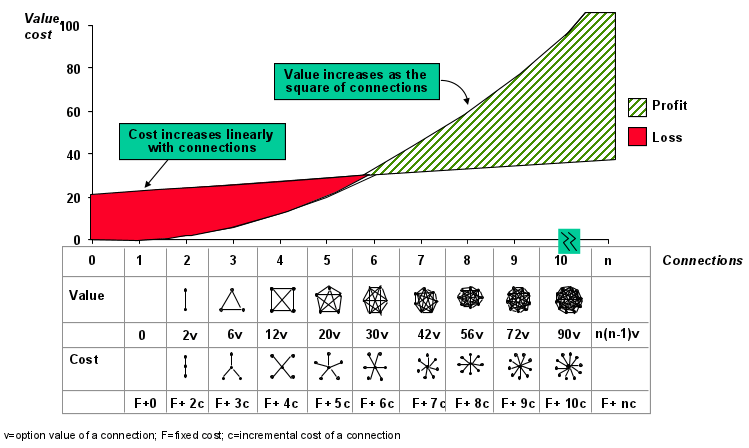 Networks that support the construction of communicating groups create value that scales exponentially with network size, i.e. much more rapidly than Metcalfe’s square law. I will call such networks Group-Forming Networks, or GFNs. What exactly do I mean by conflicts of interest? I love to buy books from Amazon. To save money, I prefer to buy used books if that is at all possible. Amazon has allowed independent merchants to market their goods in its marketplace. many of these merchants sell used books at substantial discounts to the price of a new book offered by Amazon. Let us assume that each time I wanted to make a purchase Amazon compelled me to purchase its own offering of that item, or pay a penalty if I insisted on making the purchase from one of its independent sellers. What effect do you think that might have on my behavior? What effect might that have on the behavior of the independent sellers? What if an Amazon competitor did not impose that penalty? How might that shift the competitive landscape? That is a relatively simple example. It should illustrate the point. When the operator of a network platform starts to compete with its platform partners it is engaging in behavior that will lead to the destruction of the network. What strategies should a startup that’s competing in a market in which network effects matter employ in order to win? There are a number of strategies that might be employed15 independently or in combination with one another by competitors seeking to compete effectively against a rival, or by market leaders seeking to maintain that position. First mover adoption matters – a lead of a few months can be the difference between winning the market and losing it. It can pay to subsidize adoption – in order to seed the network it might be worth it to subsidize adoption by providing an in-network benefit of some sort. Dropbox offers free storage to new users, and members who help it acquire new users also get rewarded with free extra storage. However, it is important to strike a balance between subsidizing adoption and maintaining a tight control on costs. Ideally, the marginal cost of subsidizing adoption should be far far less than the marginal benefit of acquiring a new network member. Viral marketing matters – the success of mobile and web products that benefit from network effects can be greatly enhanced by encouraging viral promotion through social networks like Facebook, Twitter, Pinterest, Instagram, Snapchat, etc etc. Redefine the market – this has the benefit of bringing in more users who might previously have been inaccessible. It also makes it possible to develop a product or service that envelopes several distinct markets into one. Think; smart phones becoming capable of performing the functions of a media player, a camera, an email editor, an internet browser, a gaming device, a phone, a medical diagnostic tool, a fitness tracker, a notebook, an alarm clock, a GPS navigation system etc. etc. Form alliances and partnerships – when competing with a powerful incumbent this might make it easier to gain a toehold from which the competitor can then launch an entry into the market. Think; Google’s Android strategy at a time when it appeared Apple’s iOS was an unstoppable force in the smartphone market. Leverage distribution channels – to pry an opening into a market think of non-obvious ways by which a distribution channel might be created. A popular approach is to bundle a new product with an existing product from the same provider. Seed the market – one way to do this is to subsidize adoption by making room in the budget for a financial outlay specifically geared towards acquiring new users. For example, a messaging app might pay people in a foreign country to download the app and start using it in hopes that enough of them fall in love with the app and tell their friends about it. Another strategy related to this is to give away product to one group of network participants. Encourage the development of complementary goods – this is now a widely used strategy through the publication of SDKs and APIs to encourage the development of complementary products and services. Leverage backward compatibility – to do the opposite would be foolish since that would mean that at the beginning of each upgrade cycle the incumbent has no advantage over a new entrant competitor. Build-in compatibility with the market leader – this changes users’ options from one in which they have an “either-or” decision to make to one in which they have an “and” decision to make. Who does not like “and”? Every new entrant rival should consider this. For example new social networks ought to build seamless integration with Twitter, Facebook and other leading social networks into the product from the very outset. Close-off access to new entrants and existing rivals and innovate constantly – this makes it nearly impossible for rivals to steal away business from the incumbent leader in the market. Pre-announcements – from a large, well known, and well liked producer of a product or service can have the effect of slowing down the adoption of a rival’s competing offering. Some people might want to wait till they can compare the options more directly against one another. Think; when one of Apple’s competitors quickly schedules its product announcement to precede a major product announcement by Apple, but only after after Apple announces an event at which it will discuss a new line of products. The extreme case is when a rival rushes to announce and release its product prior to Apple’s product release date once Apple makes an announcement. Understanding networks effects and how they unfold for an early stage startup is critical. Markets in which such effects are present are often characterised by fierce competition and a bandwagon effect tends to take hold thanks to positive-feedback loops. Also, the nature of these markets is that a winner can emerge in remarkably short order and that winner typically garners a commanding market share lead over its competitors. Furthermore, once a winner has been established it is extremely difficult for competitors to win users away from it. Platform Power – A free book by Sangeet Choudary, available for download at Platform Thinking Lab’s website.